My 2 1/2 year old son, Oliver, LOVES tractors, combines and all big vehicles. His favorite place to spend a Sunday afternoon is "the tractor store" (a John Deere implement dealer 15 miles from our house). He can spend all day wandering around looking at combines, tractors and other farm equipment. His great grandpa owned a farm but passed away in a farming accident 20 years before Oliver was born. Somehow the farming gene must have skipped two generations and went straight to my son. When I asked him what he wanted to be for Halloween he immediately responded, "a combine with a corn head" so that's what we made. We used old boxes and duct tape to create the shape of a combine. We taped off the sections and spray painted it. Oliver made sure I added the safety triangle and John Deere emblem to the back. He wears a green shirt so it looks like his arm is the chute. I glued corn kernels onto a yellow hat so his head looks like the corn that has been gathered in the bin. His candy bag is an old bag of feed corn that I cut apart and stitched together and added handles. 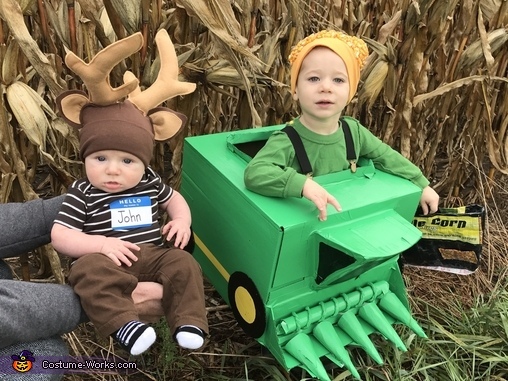 His baby brother, Finn, is wearing a deer hat I sewed (and a homemade John Deere emblem patch on his bottom). He has a name tag sticker that says, "Hi, my name is: John". So he is also a "John Deere".